Tuesday November 18th 1890 It was a pleasant day. Mother and June Harris was here for dinner. I knit a little and read in the evening. Will was sitting in a chair today. Wednesday November 19th 1890 I was busy about the dinner all the forenoon. Mary Woolf came over to spend the day. I had Anna clean the bay window in the afternoon. It was warm and pleasant. I knit all my spare time through the day and read in the evening. Thursday November 20th 1890 It was a fine day and we done the washing. Will and I were in town all afternoon. I ordered groceries and called at Minnie Shavers where Mother and June were and Will sat at Moons drug store but did not see the Dr. We came home before it was late as I had the clothes to roll up and other things to do. Knit in the evening. It was six years today since Charlie and Ida were married. 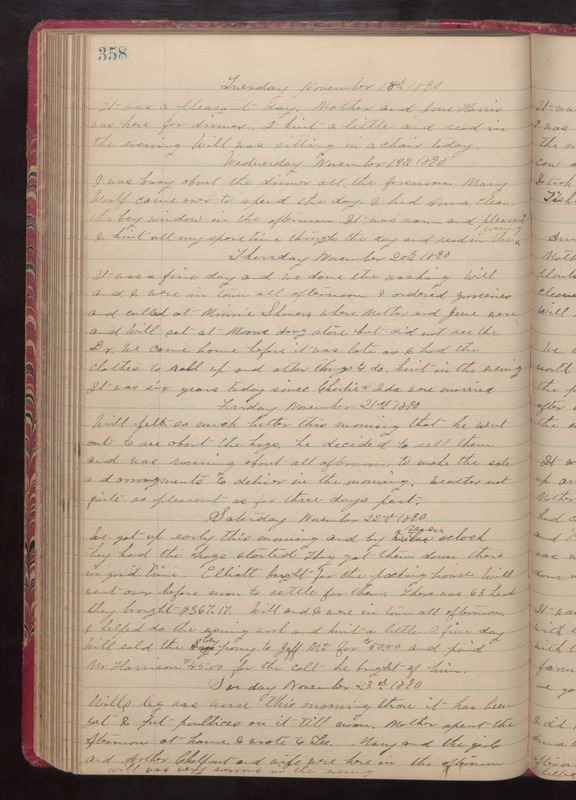 Friday November 21st 1890 Will felt so much better this morning that he went out to see about the hogs. he decided to see them and was running about all afternoon to make the sale and arrangements to deliver in the morning. weather not quite so pleasant as for three days past. Saturday Novemver 22nd 1890 We got up early this morning and by seven oclock they had the hogs started. They got them down there in good time. Elliott bought for the packing house. Will went over before noon to settle for them. There was 63 head. They brought $367.17. Will and I were in town all afternoon. I helped do the evening work and knit a little. A fine day. Will sold the bey pony to Jeff Mc. for $50.00 and paid Mr. Harrison $45.00 for the colt he bought of him. Sunday November 23rd 1890 Wills leg was worse this morning that it has been yet I put poultices on it till noon. Mother spent the afternoon at home. I wrote to Lee. Mary and the girls and Arthur Chalfant and wife were here in the afternoon. Will was very serious in the evening.